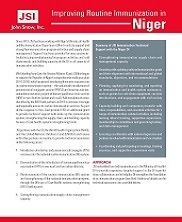 Through funding from Gavi, the Vaccine Alliance, JSI has been working with Niger’s Ministry of Health and the Immunization Department since 2013 to support and strengthen immunization program activities and supply chain management. JSI has provided support for new vaccine introduction, improved planning for program activities and cold chain needs, and building capacity of the Immunization Department in all aspects of immunization activities. JSI, 2018.